'Choppergate' MP also says lots of them are 'drug addicts'. Bishop, before she was forced to resign as Speaker over her expense scandal. Former MP Bronwyn Bishop, who was forced to resign as Speaker of the House of Representatives after using taxpayer funds to take expensive helicopter rides, claims "many" people with depression are "rorting" the welfare system, and are "drug addicts". Bishop -- whose own abuse of the parliamentary expense system was so egregious that it spawned its own "-gate" suffix in Choppergate -- took aim at people with depression on Sky News on Wednesday night. The former MP, who was defeated in the preselection process for her seat of Mackellar before the July election, said people with depression were "rorting" the pension system. "The ones that go on that pension, who go under that heading of depression, many of them are drug addicts," she said on Sky News. "There are a large number of people who were rorting it and there are a large number of people who are drug addicts and they think they meet the criteria." The Diagnostic and Statistical Manual of Mental Disorders, Fifth Edition (DSM-5) lists addiction as a substance abuse disorder, alongside other mental illnesses. Bishop gave her opinions on rorting in response to comments made by Tony Abbott, who said people with "a bit of depression" probably shouldn't be on disability pensions. Abbott made the comments in a 2GB radio interview on Wednesday where he said, "We were far too ready to put people on the [disability support pension]". 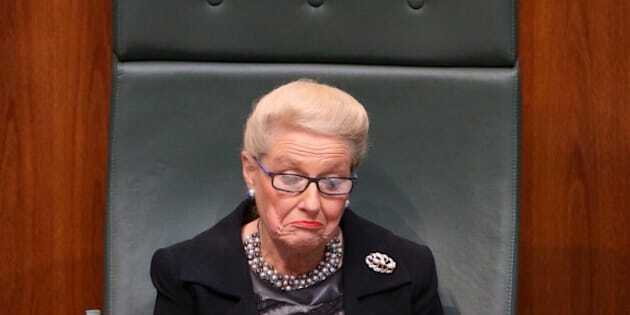 Bishop was forced to resign as Speaker in 2015, after she chartered a $5200 helicopter flight from Melbourne to Geelong -- which would have been a 90 minute road trip in her Commonwealth car, also paid for by the taxpayer -- for a Liberal party function. After a huge public uproar, Bishop eventually repaid the cost of the flights but did not apologise, calling it merely an "error of judgement". She also famously billed the taxpayer $88,000 for a 15-day official visit to Europe in 2015, and nearly $43,000 for an 11-day trip to Asia.